At this time of year many teachers will, hopefully, be approaching the end of teaching all the A-level content for Sociology and then be faced with the slightly daunting task of revisiting and revising all the material from the last 18 months. Despite the many criticisms of the linear style A-level (which have been well documented), one area that this structure perhaps does benefit from is the ability to get students to think, learn, prepare and revise synoptically. How to use it: Any question on Functionalism or consensus can refer to this idea that society works like a human body as it explicitly refers to the idea that all institutions need to work in unison in order to be effective. Whether it is a question on culture, family, education, crime or religion then this term is applicable. It is an easy term to understand but useful for nearly all topics. How to use it: Like the organic analogy, this term looks at how a range of institutions work together; however, it views this in relation to conflict and therefore makes a perfect counter-argument to the organic analogy. This is a term that can be applied to pretty much any topic were a question on Marxism or power to arise. How to use it: Students are most likely to use the idea of labelling on the education topic but the simple idea of people attaching a stereotype or expectation to an individual can be used in relation to culture, beliefs, crime and work too. The beauty of this term is that labelling is relevant to questions on social class, gender, ethnicity, disability, sexuality and so on too. Students can also link the term to ideas of scapegoating and the self-fulfilling prophecy. How to use it: The term male gaze tends to be associated with media and how the lens of the camera objectifies or sexualises the female. However, along with the term ‘malestream’ this term also can be used to describe how much of the research and findings in all fields of sociology can often be viewed or defined from the male point of view. Indeed, just ask students to name 20 key sociologists and then note how many are male. How to use it: Students are probably aware of this term to describe how females may receive lenient sentences and punishments in relation to crime. The term however can also be useful in discussing issues such as the feminisation of the education system (male students are more likely to be suspended or expelled for example) or how some divorce and child custody cases may favor the female. Criticism of Pollak’s rather controversial and outdated views on gender and crime can also pick up valuable evaluation points in essays. How to use it: Although Baudrillard first defined these terms almost 40 years ago, the ideas of simulacra in our media saturated, hyper-reality world are arguably more applicable today than ever before. In particular these terms are useful for anything in relation to identity and how we present ourselves to others, how we are engulfed in a consumerist world, the presentation of media and how increasingly representations have become more important than the ‘real thing’. How to use it: A classic term which naturally lends itself to a range of topics as it refers to the set of shared beliefs, ideas, and moral attitudes which operate as a unifying force within society. Students can use this to describe how culture works, how schools can work, why the nuclear family is seen to work, how religion works or how society acts as a collective conscience to determine what is deemed criminal or deviant in any given society. The use of this term also sets up a clear debate with the conflict theorists of Marxism and Feminism. How to use it: Students may be aware of this term within the topic of beliefs and how many people are now spiritual shoppers, picking and choosing differing aspects of religion and beliefs to suit their own personal needs. The term however can also be used to describing any form of hybrid identity in relation to culture. It is also useful to explain the increased individualism in regards to personal/sexual relationships and the move away from the traditional nuclear family. Perhaps the first task you could try following the Easter holidays is to give your students all 8 terms and see if they can relate the term to each of the topics you have studied, that will give you a chance to see how well they can think on their feet and also gain an insight into how much revising they have been doing! Finally, the very best wishes to all your students in the upcoming exams. Matthew has been teaching Sociology for 16 years and has taught in the UK, Kenya and Spain. He currently teaches at Bellerbys College in Brighton. Matthew runs the www.podology.org.uk website and is continuing his mission to visit every country in the world. 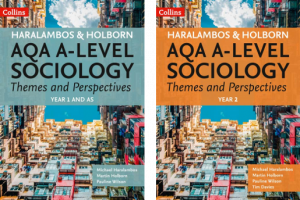 He is also a contributing author to the Themes and Perspectives books written specifically for the current AQA A-level Sociology specification.